Remember that lunch at the beach, that lingering moment of happiness? The second ‘Grafton surprise’ we found on this Travel Australia house-sitting assignment is the easy access to beaches. For a city that we think of as being ‘inland’ it seems incongruous that one can get to the beach faster than most residents of major coastal cities. If you shun the highways as we do, the most interesting way to reach the coast ‘the scenic route’ is via the northern side of the river. A modest bitumen road follows the Clarence past farms raising their cattle and crops on the rich fertile flood plain, through a couple of villages to the first ferry which takes you across to Ulmara where the Pacific Highway cuts through this tiny town. If you bypass this crossing, the second is at Lawrence (see photo above). It is likely that Lawrence and its ferry crossing will always be a village because it is on the ‘wrong’ side or the river, if growth depends on the multitudes, totally ignorant of its existence, scurrying between Brisbane and Sydney. Entry from the south into the village is over a small and charming timber bridge that spans a small tributary that joins the Clarence in Lawrence. 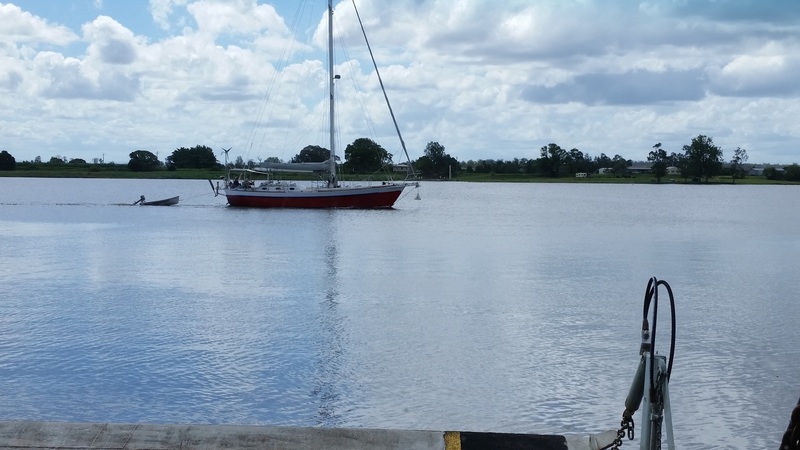 Once one passes through the village and crosses the river on the ferry (sometimes waiting for a yacht to clear the ferry cables) the road runs for several kilometres terminating in the town of Maclean. This postcard town is now separated from the Pacific Highway and all the better for it, with a thriving local economy and plenty of visitors who just like to stop and ‘be there’. With its quaint zig-zag main street and ‘country’ style shopping, the place has atmosphere. If you use the Pacific Highway, the run to the nearest beach is less than 40 minutes. The most distant ‘local’ beach would be Iluka and even that is less than an hour away. We particularly liked Iluka, more of a village than a town, for its undiscovered feel and it was sharply contrasted with Yamba, its opposite neighbour across the Clarence River mouth. 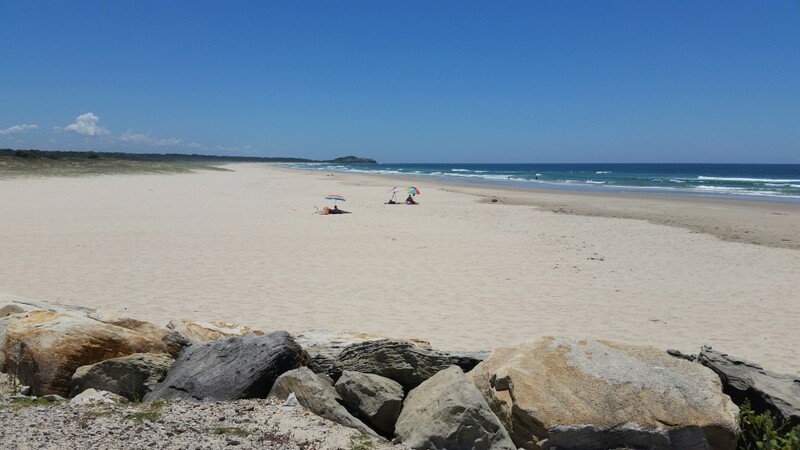 Iluka seems to attract families in particular and has both a spectacular beach, safe calm water for kids inside the rock wall protecting the Clarence River mouth. There was something about the vibe of the village that had the ability to evoke childhood memories. 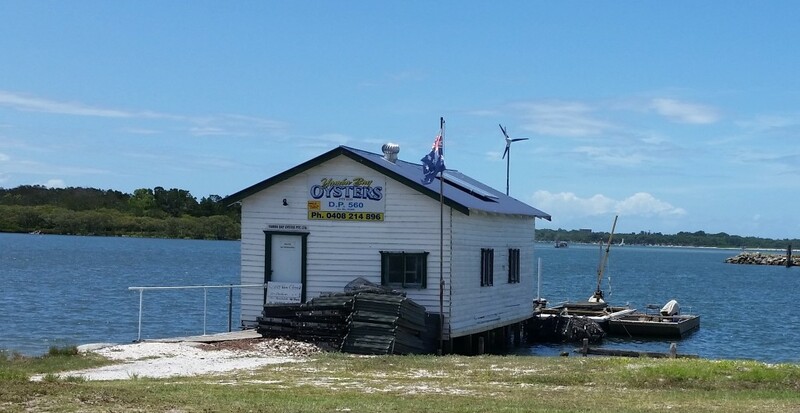 Yamba is more accessible from the highway when heading north from Sydney and popular local theory holds that this is the reason why it is becoming another version of Byron Bay. It is more populous and definitely has a significantly more commercial edge than Iluka. Both beaches are roughly 50 kilometres north east of Grafton and a very easy drive especially if one uses the highway rather than the more scenic road on the other side of the Clarence which involves a ferry crossing. For all the insuperable creep towards commercialism, Yamba still has the lap of water on a semi-deserted estuary beach, it has crystal-clear water, that wonderful smell of the sea, fishing boats, a maze of waterways but has not yet been ‘blessed’ by the inundation of people hoping to share the space and ironically destroying the tenuous atmosphere they are seeking. Best you waste no time seeing it. The sun was warming the crisp air and we just sat eating our fish and chips in silence. In front of us, perched on short stilts over the clearest of clear calm water, was the perfect example of a boat shed. The sky was a summer blue although we were near its end, the scattered clouds were wispy white and the smell of the seaside took me back to long distant holidays in Caloundra when pocket money came in sixpence at a time. There were so many calls on my senses, the view of the boat shed, the sun, the sky, the clear water, the sea birds hoping for a handout and more than anything else, the peace. The peace, it contrasted so sharply against the turmoil, the life-draining stress of times not long past, when we lost almost every possession in the devastating company crash that terminated our previous life. Just slightly fading now, the still acrid memories of the 4am waking with stress-induced chest pain, the fear of losing a life’s work and the shame of failure were difficult memories to reconcile with the utter opposite of ‘now’. At this moment, a rhetorical question arose in my mind, ‘what could I add for this to be perfect?’ to which I silently respond, “nothing”. To the south east a little closer are two more great little beach villages, Minnie Waters and Wooli (pronounced wool-eye). Of these we really liked Wooli with its narrow strip of land between the Wooli Wooli river and the ocean and a couple of hundred houses and shacks lined up taking advantage of what little land is available. There is no hotel or even a significant store but the caravan park handles the basics. Maybe it is the combination of quiet attractions that so appeals, a really beautiful little river, with coloured rock cliffs, man-made rock walls for fishing, a superb beach, a bush shack village atmosphere, no commercialism, good access for boats, what more is there to want? 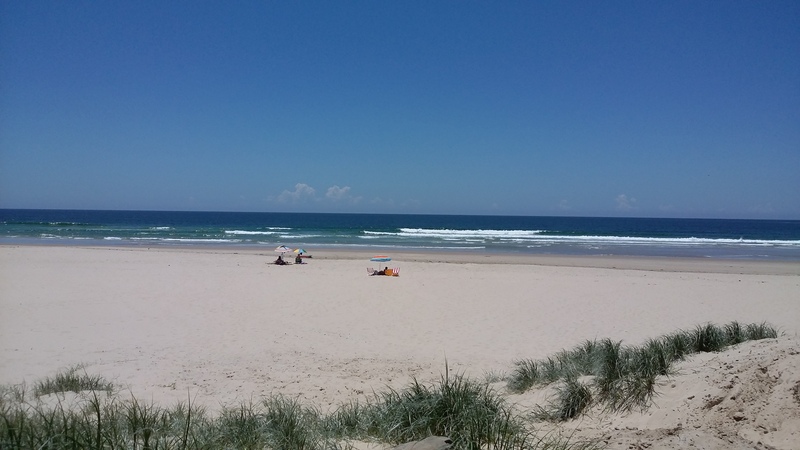 A good day-trip from Grafton is a drive south towards Coffs Harbour. Just over half-way, the road comes its closest to the coast at Corindi Beach. This is attractive but not special, by our evaluation anyway, with a good caravan park on top of the cliffs and access to the endless beaches in this part of northern NSW. Our main interest here was taking the narrow coastal dead-end road north a little way to the village of Red Rock, forever locked in our memories for a holiday we took there in 1975. It was off-season, we were young, our children were small and we were able to rent one of only a dozen beach cottages that had been built at the river mouth. The weather was mostly rainy and cold, enough to have a romantic fire most nights but warm enough in the day to entertain the kids in the calm waters beside the backwater beach. There were a few older permanent residents around to say hello occasionally, but we felt quite alone most of the time and very happy. What makes this brief time so important to us is hard to say, but we will never lose it, so finally getting back there, nearly 40 years later, we hoped not to find too much had changed. Fearing the worst and hoping for the best is not a bad way to approach your memories and fortunately for us, Red Rock is still a mostly unspoilt, quiet village by the sea. We could not positively identify ‘our’ cottage but it didn’t really matter, we could briefly relive some of those moments and that was OK too, more than OK.
After trundling back along the Red Rock road, we rejoined the Pacific Highway to reach Woolgoolga headland and spectacular views along the coastline, aside from the unfortunately placed rubbish bin. That’s the penalty for being too lazy to get out of the vehicle to take photos. This halfway point was as close as we went to Coffs Harbour however we were scheduled to pass through there on our way south in a few weeks so for today, we took the country ways back to Grafton to satisfy the dinner demands from our little bosses who would be expecting us. I remember the holiday at Red Rock, as I drove up from Sydney to see you and Julie, with my good fishing mate Kevin, hoping to catch a few – but as you mentioned, the weather was wet, and we didn’t see even a scale.